With a grant from the DALMAC Fund, support from KBC coffers, and donations from several bike-friendly supporters the “Give Them 5” education campaign is underway. Initiated and organized by Paul Wells, chair of the KBC Education Committee, the campaign is aimed at raising motorist and bicyclist awareness of recently approved five-foot passing ordinances in Kalamazoo, Portage, Kalamazoo Township, and Oshtemo Township. As a means of getting the word out, yard signs are already beginning to appear along streets and roads in the Kalamazoo area. 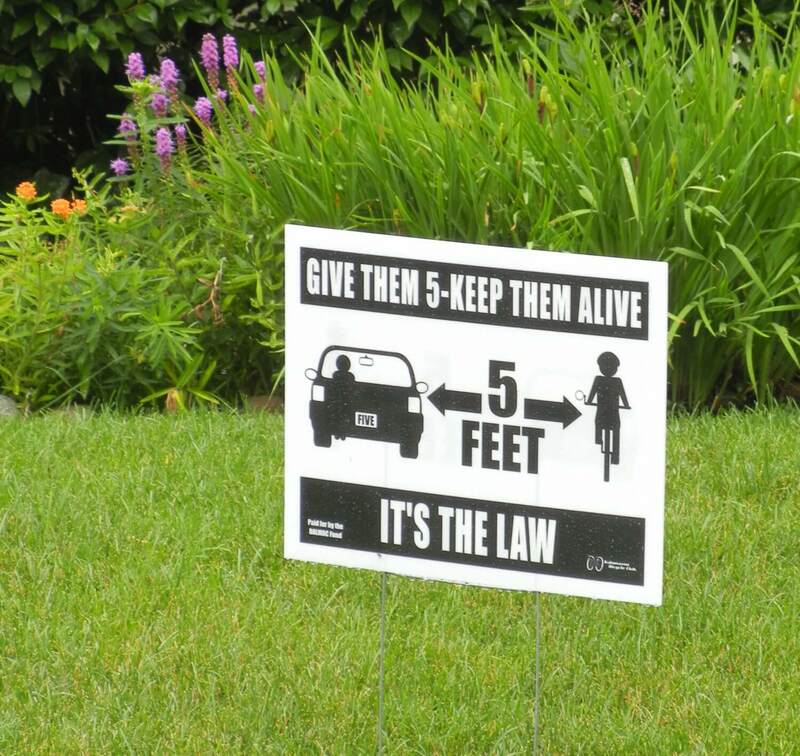 Available to anyone willing to put the sign in their yard, these signs can be obtained by sending an email to Paul Wells educationchair@kalamazoobicycleclub.org, who will also happily accept donations to KBC in support of the education campaign. Alamo Township Repaired West AB Avenue!! The Alamo Township Board allocated funds to repair the nasty stretch of pavement on West AB Ave that has been a hazard (aka bicycle handling feature) on KBC Wednesday Nite Rides for many years. That stretch of road is now a short, but beautifully smooth, ribbon of new pavement. Even though the gleeful cheers cannot be heard in the photo below, KBC members on a recent Wednesday Nite Ride expressed thanks to the powers-that-be for a job well done.